It was time to leave behind the tranquillity of Hermanus and despite its surface serenity I was pretty worn out what with the Wine Tours, Whale watching, micro-lighting, Safari and Great White Shark diving. We were now heading for the famous Garden Route. 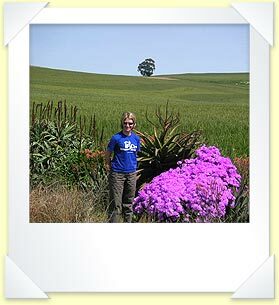 Even before we got anywhere near the Garden Route proper we drove through ever changing landscape from scenery reminiscent of the American mid-west open plains, European countryside, Scottish highlands and English dingly-dangly rivers, brooks and streams. The town of Swellendam greeted us with a Lord of the Rings style evil mountain backdrop. Menacing clouds obscured the peaks but fortunately for us we did not need to test their resolve as our road swung right, away from their threatening posture. We stopped off at Gouritz River Bridge to witness those brave enough to sample South Africa's only commercial bridge swinging operation. Unlike bungee jumping, where you jump off a bridge with giant elastic bands tied to your feet or some other part of your body, with bridge swinging you are tied to a rope that is attached to a neighbouring bridge and swing under it. It looked exhilarating but there was no way I was going to find out first-hand. If you wanted to be a purest and claim that bridge swinging was for the less adventurous, you wouldn't have had to wait long, because a few days later we visit Bloukrans Bridge at Tsitsikamma, which is described by the Guinness Book of Records as the highest commercial bridge bungee jump in the world at 216 metres. Fortunately for us, or maybe it was all down to Percy's advanced planning, we didn't have to wait long at either location to see some adrenalin junkies take the plunge. 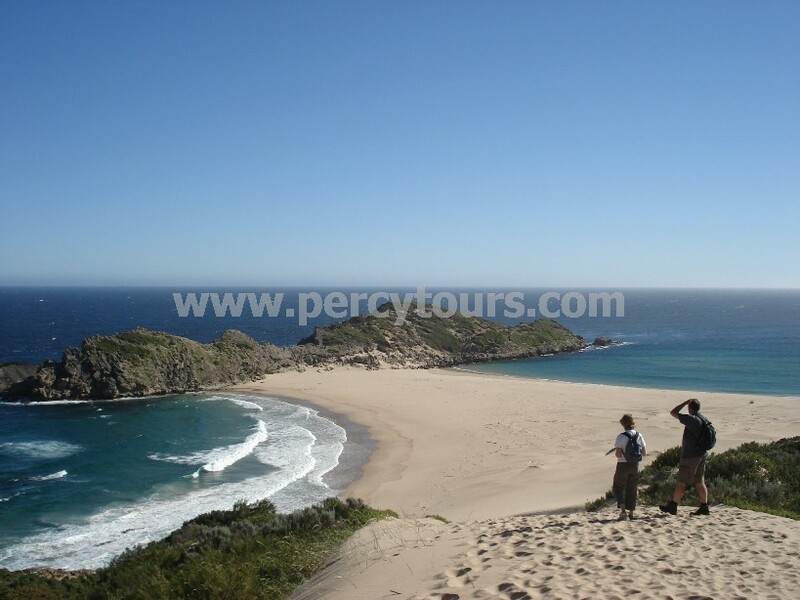 Mossel Bay is said to be officially the start of the Garden Route, although Percy says it really starts at George and Wilderness and I would have to agree with him because if you were going to nominate a town as gate keeper to an area of extraordinary beauty you could do much better than Mossel Bay. Mossel Bay appeared to be dominated by the petrol refinery industry which takes centre stage and luckily for us the N2 road cuts a swathe through the town allowing a “been there done that” tick without us having to drop below 100kph. 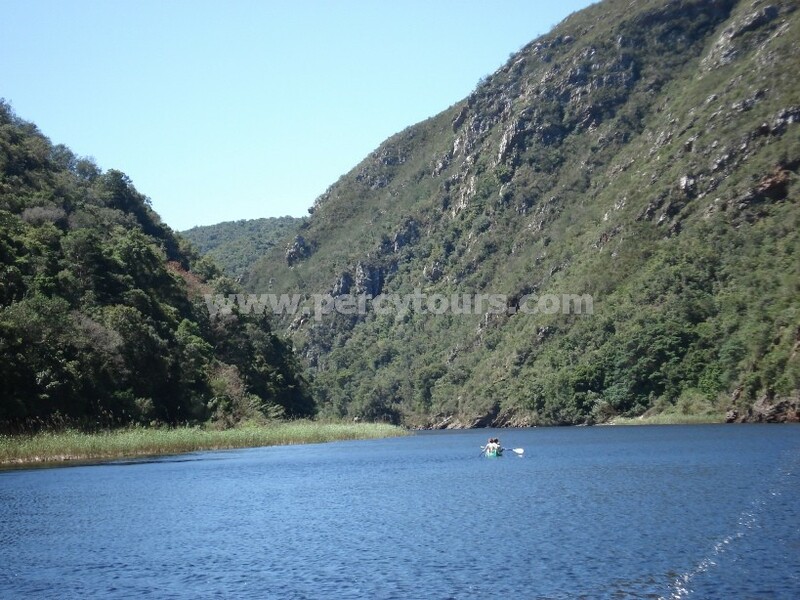 If the approach to the Garden Route is reminiscent of French country side, the Garden Route starts its show off at Wilderness, with a slice of Black Forest gateaux with its fern filled valleys and lakes and it's not long before I start to understand why it has been named the Garden Route. The N2 is tamed as it is forced to shed its highway status and instead become Knysna's picturesque main high street. I had heard a lot of good things about Knysna and although I arrived with an open mind it was perhaps not what I expected but I had 3 days to work it out. 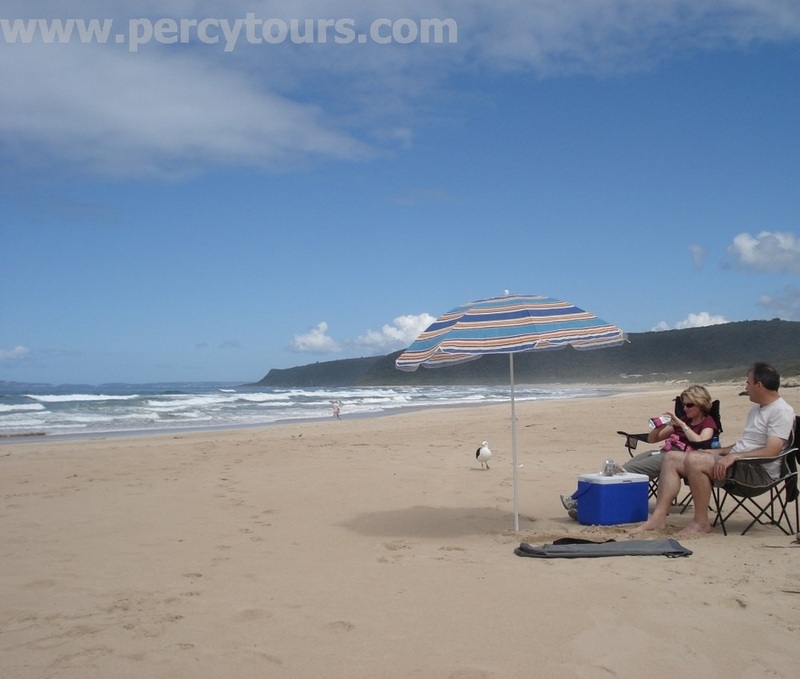 Knysna is situated in a huge natural bowl, with the lagoon taking centre stage and private houses scattered up the slopes giving each their own stunning view and in the middle of the lagoon is Thesen Island which is where Percy had booked me into a hotel. Thesen Island is very “New England” like, with wood faced buildings painted in light pastel shades of grey, green, blue and off-white; oldy-worldy with a modern twist. The Waterfront appears to be the main place to go in Knysna and it had a good selection of places to eat but did seem to lack anywhere just to sit and drink and soak up the atmosphere. However the restaurants we tried each evening did give excellent service, serve up delicious food including an outstanding springbok steak in chilli chocolate sauce and the oyster bar that was a short walk from the main drag, was well worth the detour to be able to sample the local fare, washed down with some splendid local Chardonnay. 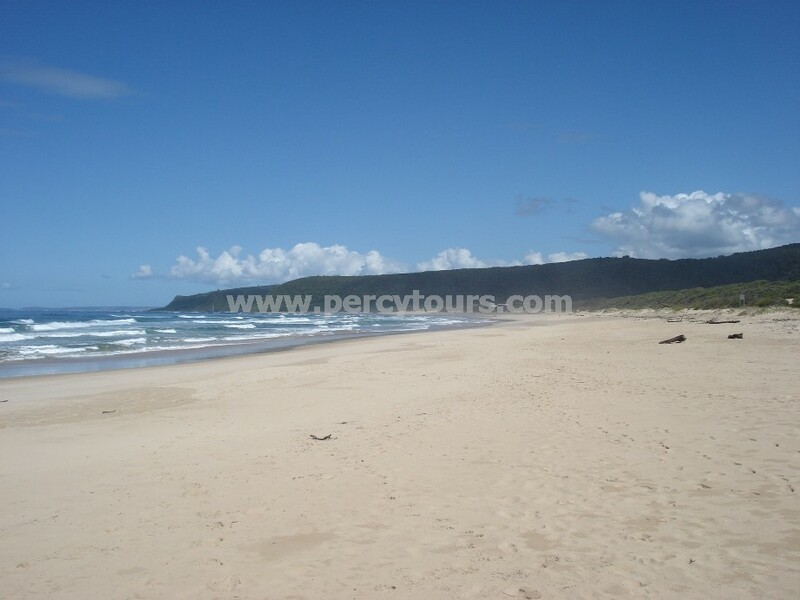 Although Knysna is a destination it would appear that the reason people are attracted to Knysna has less to do with the town itself and more to do with what surrounds it. A little way outside Knysna is the very British sounding place of Brenton-On-Sea, that boasts a beach that would be perfect if it were not for the sea temperature being so cold and for my entertainment Percy had laid on a number of early morning surfers riding the waves, some with more ability than others. There were also a few paragliders floating in the thermals above us. A walk along Buffalo Bay’s unspoilt beach was a great way to start any day, with the waves crashing effortlessly providing a loud but calming effect. 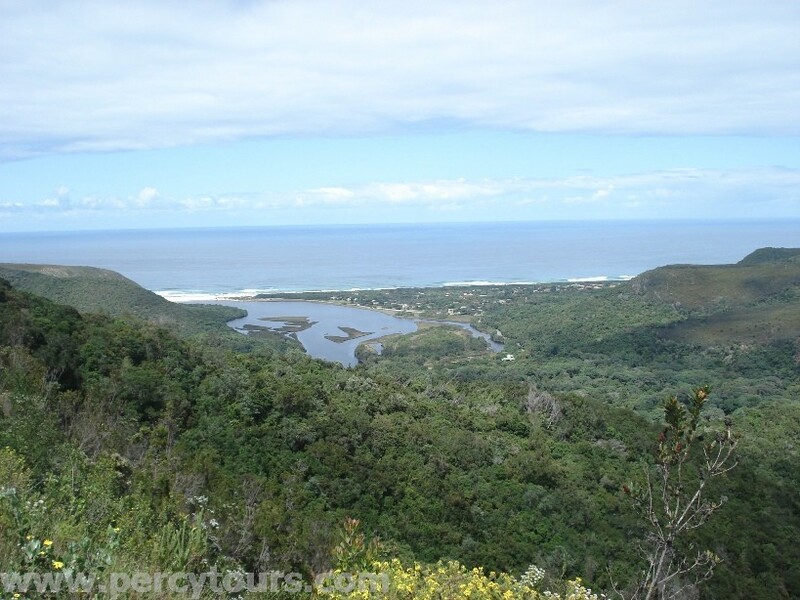 North East of Knysna is the Knysna Forest. You can tell you're heading into the wilderness as the road soon turns from tarmac to dirt and we travelled for 20 minutes towards the forests centre eventually arriving at the Big Tree. There is no disputing that it is a big tree but you may have seen bigger, however size isn't everything and even in a forest of trees it does stand out from those that keep it company. We leave the comfort of the tour bus and head off to hike one of the trails that are colour coded, Percy suggests we add a little further spice to our adventure by choosing the yellow elephant walk route that although was marked on the trees was not shown on our map. The walk followed a narrow dirt track road before veering off into jungle proper. The trail was well defined and we walked in single file for some 15 minutes before we stopped to hear the silence save for the occasional bird life calling from high up in the dense tree tops. Possibly the rare Knysna Lourie, but we couldn’t be too sure as we didn’t see them. The yellow elephant walk turned out to be a 14 km trek, up and down with the mid-point being marked by a picturesque and easily navigated stream. Considering the blistering heat of the previous few days it was the perfect day for hiking, as it was grey and overcast with the odd bit of drizzle, just enough to dampen the earth. After 14 km I was glad to see the luxury Percy Tours minibus again and although exhausted I was also refreshed having consumed large quantities of the fresh forest air. From Kynsna Forest we headed to Noetzie Park which is situated south east of Knysna. No sooner having found the tarmac roads again we then left them again to travel along another dirt road passing through a township, that despite having little in the way of structure did have spectacular views overlooking Knysna. As a strange paradox no sooner had the township petered out, we then pass land that has been earmarked for a luxury development, I guess those shacks we passed might be worth a little bit of money one day. 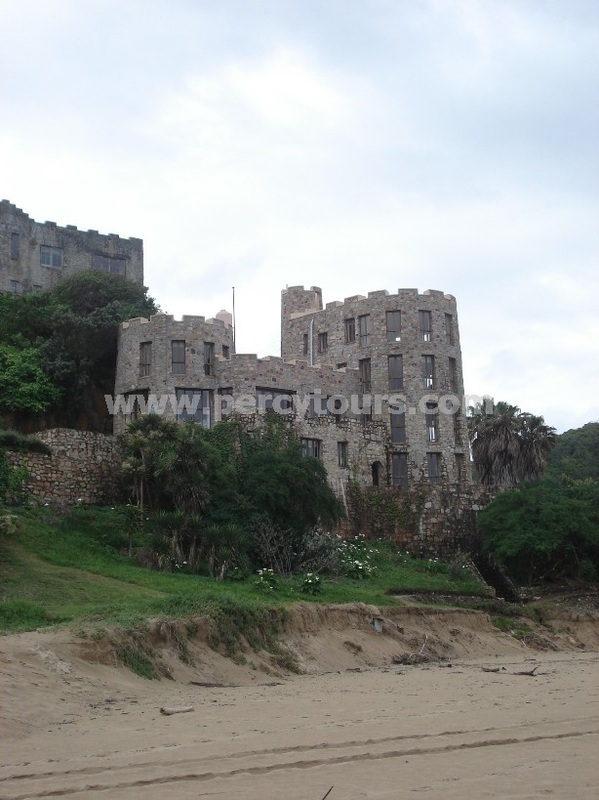 After a 15 minute drive we reached the coast and Noetzie castles built on rocks overlooking a sandy beach. A beautiful setting, the castles themselves were interesting but a little disappointing, being castles only in the mock historical sense. To be fair Percy explains that the original house was not intentionally built as a castle, they merely used local stone and noticed that once completed the finished building had a passing resemblance to a castle, so they added a few finishing touches, thus starting a trend. Sadly the houses that followed were built to resemble castles but fall well short of achieving anything other than pure kitsch. There were a few protest slogans on display and so I am guessing that not everyone is happy that more buildings are being built on what should be in all rights a conservation area. The Knysna Lagoon empties into the sea thro’ a small opening called The Heads. We drove to the bottom of this opening and were refreshed by the sea spray hitting our faces. Then we ascended them, to take in an aerial view from the wooden walk-ways, high on the cliff edge. Descending once more down to the other side, to stop at the well positioned pub and restaurant, for a meal and a cooling beer, at the seas edge.